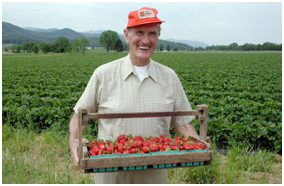 Scott Strawberry & Tomato Farms, Inc. was founded in 1959 by Wayne Scott. Wayne Scott was a high school agriculture teacher who dreamed of putting what he taught to practice. Wayne and his wife Mary Lou worked hard for many years and built a very reputable name not only in the strawberry business but also in the tomato business as well as half runner beans and sweet corn. They were not only successful in their business but in their family life as well. They had five children that grew up working on the farm. Becky, Carole, and Mike all graduated from college with a degree in education. After teaching for several years Carole is now employed by the farm and Becky and Mike have continued their careers as educators. Sons Steve and David Scott joined their parents in the business. Steve graduated from Virginia Tech with a degree in Horticulture in 1979 and farmed by his father's side for over 30 years. David graduated from the University of Tennessee with a degree in Agriculture in 1980 and the two of them have worked hard to maintain the level of standards that Wayne and Mary Lou set years ago. 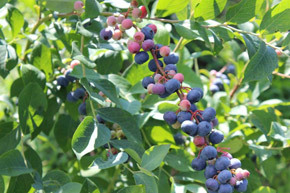 Scott Unaka Mountain Blueberries was started in 2008 by Steve Scott and his sons Cody and Ryan. We grow four different varieties which are harvested from early July to the end of September. The blueberries are sold at Scott’s Farm Market in Unicoi. We also have blueberry preserves made with our own blueberries. Follow us on facebook for up to date crop information. Following is a list of the produce currently available at our Farm Location. DURING THE MONTH OF APRIL SCOTT'S FARM MARKET WILL BE OPEN FRIDAY 9-6 AND SATURDAY 9-5. WE HAVE OUR HOMEMADE ICE CREAM, PRESERVES, HONEY, COFFEE, AND OTHER GOODIES. OUR NORMAL BUSINESS DAYS AND HOURS WILL RESUME ONCE STRAWBERRIES ARE READY! LIKE US ON FACEBOOK AND INSTAGRAM!! Strawberries are the first crop of the harvest season. Scott Strawberry & Tomato Farms offer produce for both wholesale and retail markets. We ship tomatoes nationwide, sell strawberries from our retail stands, and have a produce market located in Unicoi where we sell a variety of vegetables fresh from our fields. Our office is located in Unicoi, TN. The Packinghouse is at this location where we grade and ship tomatoes. Our strawberries are the first crop of the season. The strawberries are picked fresh each day and sold at our retail sales stands located from Knoxville to Bristol. The delivery times for our retail stands vary due to weather conditions each day. It is best to call the office or visit our strawberry page for the most up to date delivery information. Scott’s Farm Market, located in Unicoi, opened the summer of 2015. Our moto is “If we didn’t grow it we know who did”. We grow a variety of garden vegetables that are picked fresh and delivered straight to the market. Visit our Market page for details.